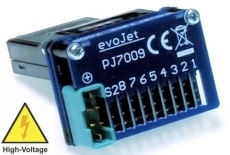 The PowerJack 7009 is a 8 channel Servobox with SBUS2 output for the 7008SB (6308SB) receivers. It will be plugged directly by tight precision contacts onto the receiver. The power can be supplied by a MPX high amp connector from the battery or a power-switch harness. Because of its small and lightweight construction, the Power-Jack 7009 is particular suited for small and medium large models with long wiring and digital servos. This Product was added to our catalogue on Wednesday 20 November, 2013.